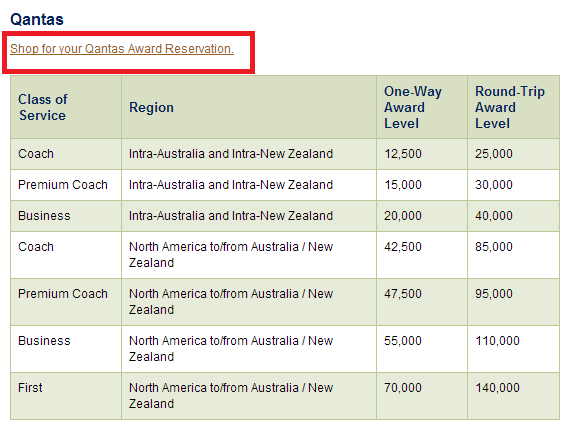 Award Alert: EK and QF online one-way bookings on Alaska Mileage Plan! This is absolutely fantastic news and I have been waiting a very long time for this. Alaska Airlines has revised its partner award charts to allow one way bookings for many airlines, including Cathay Pacific, Qantas, Emirates, and Air Pacific!! Earlier this year, Alaska put one-way and online bookings in for BA, AA, and DL. The one-way awards are half of the round-trip awards which is fantastic, which means you can fly QF F for 70k miles and EK F for 100k miles! This pairs really well with EK swapping LAX to an A380 on Dec 2. Edit: I’ve taken a closer look and it seems like there have been FT reports of space not displaying correctly. Keep that in mind. I am on Facebook and Twitter – don’t miss any more posts like these! But what is even better is that you can now book awards online on Emirates, Qantas, and Air Pacific! On a Qantas note, it seems that the award engine doesn’t let you search up to 365 days in advance, so to snag that QF F space, it looks like you’ll need to phone their call center. But this has just made Alaska Miles a heck of a lot more valuable. I would say now the Alaska Miles are the ONLY way to for Emirates First travel, given that JAL Mileage Bank requires roundtrips and frankly I don’t have that much SPG to spend. Alaska miles are now also an excellent way to get to Australia given that they have access to Qantas Space online and in one-ways, and as well Cathay Pacific via HKG if all fails. It also looks like pairing Air Pacific redemptions online with other awards are now a lot easier. Unfortunately you’ll still need to book your Cathay Pacific awards through the call center and Korean Air awards still need to be roundtrip… but oh well! One-way “good” partner awards and online booking in one day, wow! ??? And also N America to Asia 100K one way first class. That’s really interesting. For EK skywards members, the only way to redeem F awards are roundtrips (there are no saver one-way First class awards.) I wonder how Alaska managed to get one-way savers from EK. Often times redeeming with another partner will give better value than redeeming with the miles with the airline that flies the route itself. This is exactly an instance of that. 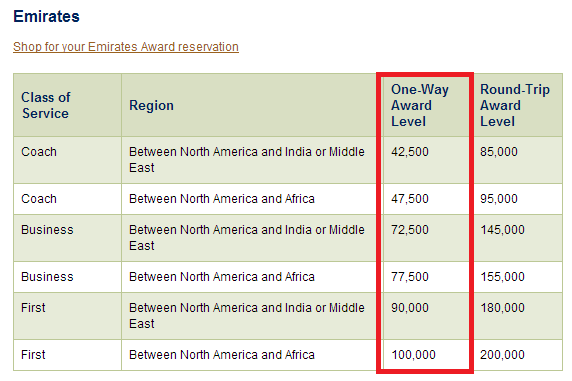 I should say that Emirates doesn’t have a saver level at all for any of its one-way awards (first, business, or economy)… perhaps that’s the reason why no one could find them on AK website? Try searching for roundtrip and people may find them. I saw a one-way business class ticket on EK JFK-DXB on a date just a few minutes ago. What doesn’t show up is the last-minute F space. 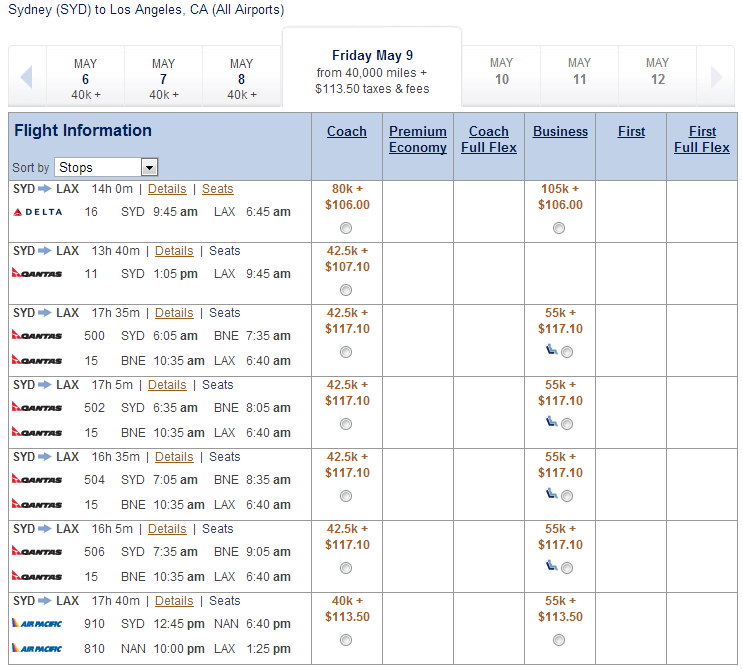 Seeing that Air Pacific can be booked online as well. Actually Jeff, I don’t know how Alaska Airlines did it but you’re right. I saw a JFK-DXB business class one-way seat… and it only had $30 taxes/fees! I know EK charges fuel surcharges when redeemed from its own FF program. Wow. Alaska miles are indeed more valuable now. Yep F space doesn’t show up on the Alaska site for Emirates. From looking at the Emirates Skywards award tool, I see there’s First Class saver DXB-JFK (77W) on Oct 14th and JFK-DXB (A380) on Oct 15th…. but there’s nada on Alaska website. Does that mean it’s still possible to book the above routing by calling Alaska partner desk? I see it on Expertflyer too, so should be bookable through as call center. Not sure if you can redeem EK North America to Asia using AS?